Defender Zander Diamond has hailed the ‘quality and depth’ of the Cobblers squad ahead of the weekend trip to Notts County. 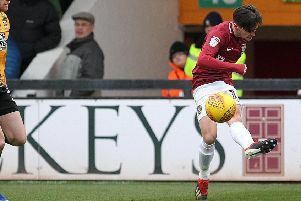 With the injury list at Sixfields easing significantly in recent weeks, competition for places is hotting up at Northampton, and that is exactly what Diamond wants. As it stands, only Paul Corry - who is out for the season with a knee injury - and winger Ricky Holmes are unavailable for selection, and that means there are plenty of headaches for manager Chris Wilder when it comes to naming his starting line-up. The team is in a real purple patch of form at the moment, and has moved up to third place in Sky Bet League Two. Town were 1-0 winners over promotion rivals Mansfield Town last Saturday, with Chris Hackett, Evan Horwood and Josh Lelan not even making the matchday squad. The likes of Ryan Cresswell, Ryan Clarke, Ryan Watson, Jason Taylor, Sam Hoskins and Dominic Calvert-Lewin were all left on the bench, and Diamond believes that strength in depth can only be good news for the Cobblers. “Throughout the whole team, the injuries seem to be clearing up and it is a real squad effort,” said the Scotsman, who has settled into a good run of form in the centre of defence. “We have boys sitting in the stand who are not even in the 18, who would walk into any team in league two, if not higher. “It is a squad game and that shows you the quality and the depth we have at this football club.